Who Needs Superman When We’ve Got YOU? 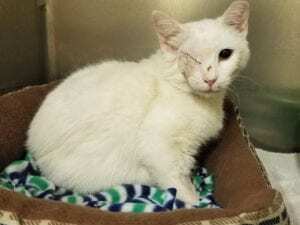 Last month, a sweet stray cat was brought to the APF after being hit by a car in Niskayuna. She was clearly in a lot of pain and needed immediate lifesaving medical attention. Our staff acted swiftly, providing emergency triage at the shelter and then transferring her to a veterinary hospital for immediate surgery. Upon assessment, we found that Spectra had suffered irreparable damage to her right eye, both of her ear drums had ruptured and she had multiple facial bone fractures. Spectra received the critical medical care she required and returned to the APF to rest up. She is now healing nicely and is expected to make a full recovery. Spectra was given the second chance she so deserves because of supporters like you. When you donate to the APF, you become a hero in the lives of animals in need. Spectra is happy and comfortable and has a great future to look forward to thanks to YOU. This #GivingTuesday, please join us in our mission to help animals in need, like Spectra, by making a contribution to the APF. Gifts of all sizes are much appreciated and will make a difference that endures. So, you’ve made your #GivingTuesday gift but you still want to do more? How about starting a fundraiser on Facebook? By asking your friends and family to join you in your support of the APF, you can exponentially increase your impact on the lives of animals in need. What’s more, Facebook will match donations collected on November 27, beginning at 8:00 AM EST, and continuing until they reach their goal of $7 million. With YOUR support, we can give animals a second chance in life. Your tax deductible contribution celebrates your commitment to changing lives and provides hope to animals in need.